These early smashing successes aside, winning such a packed Titled Tuesday is all about amassing a massive score of at least 8.5/10. Stars like Nakamura, Grischuk, and Nepomniachtchi achieved victories in the first several rounds but then dropped some critical full and half-points to their opponents. 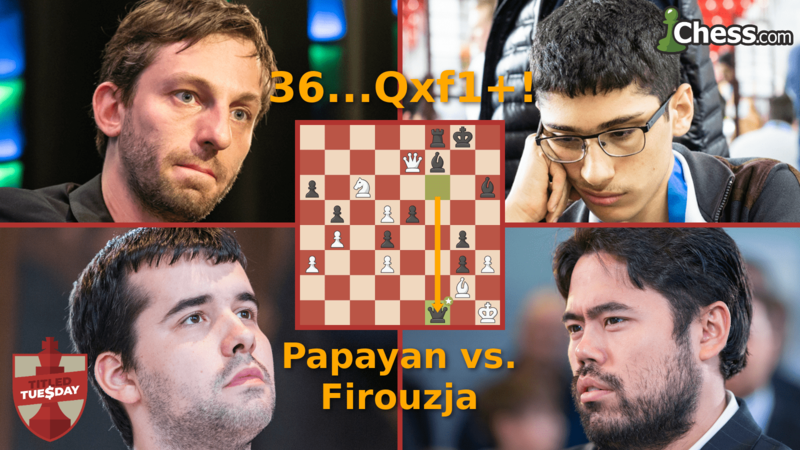 One player who knocked off one of these “big three” was Aryan Tari, who defeated Grischuk in the final round to secure a top-10 finish for himself. The ending mate was quite pleasing. Ultimately, Sam Sevian was the only player to reach a victorious 9/10 points, but his run started quite inauspiciously when he lost in round two after his beautiful attack fell apart. Rh4?? proved a costly step backward when the computer engine Stockfish’s Qg4! would have forced mate.